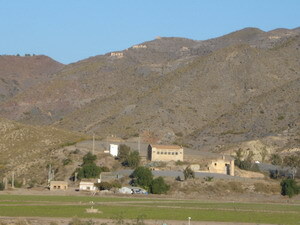 The Sierra Almagrera stretches along the coast from Villaricos towards the border with Murcia for about 10km. In that short distance were dozens of mines, going back to prehistoric times. 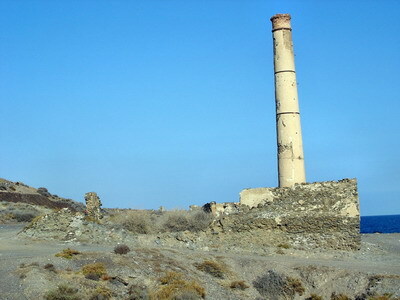 Silver, tin, sulphur, lead and Iron have all been mined here. 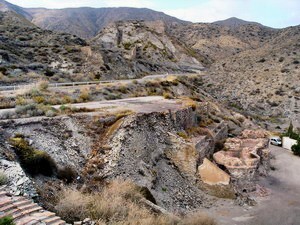 Some of these mines involved the engineer and later Archeologist, Louis Siret, who was famous for excavating the Los Millares site, qv. Like some of my other pages, progress is ongoing and I will add pictures and commentary as I am able. On the right is a sketch map of the area. 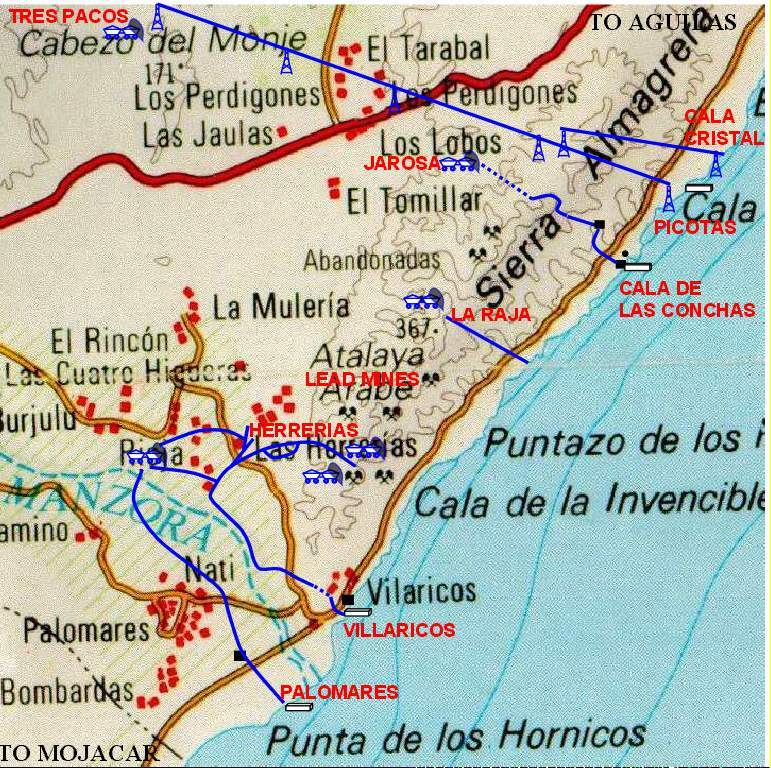 Note that this only shows iron mines, there were dozens of lead mines dug earlier and remains of these may be seen along the road to Aguilas. This was one of the largest, certainly the most ambitious in terms of transport infrastructure. Galleries, tunnels, viaducts, inclined planes, hoppers, railways and loading bays, you could find all of these, and fortunately, in some areas you still can. 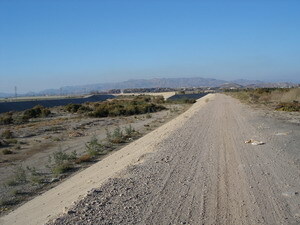 Here is a pictorial description of the route taken on the seaward side of the sierra. The huge inclined plane descending from the Sierra. 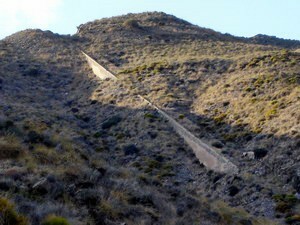 Over the top on the other side is another railway and tunnel leading to the Barranco Jarosa where the mines were situated. A short tunnel from the bottom of the plane connected with a further narrow gauge railway leading to an intermediate hopper. 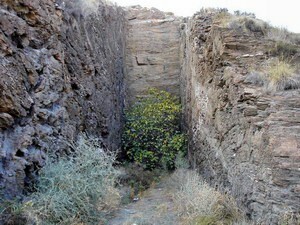 The short tunnel exit, now almost blocked. 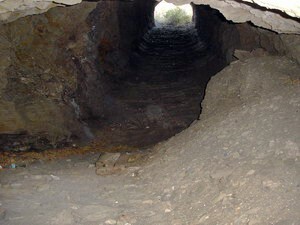 A deep cutting connected the tunnel to the railway. Looking back towards the inclined plane with a view of the railway track at the bottom of the picture. The upper level of the intermediate hopper. Wagons arrived by rail from the bottom of the inclined plane. They went round the loop, dropping their load at the end, returning on the other side of the loop. The sign says "beware of bees". The hives can be seen at the end. 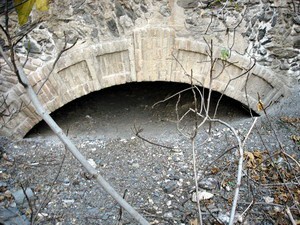 The lower face of the intermediate hopper showing one of the exit tunnels. 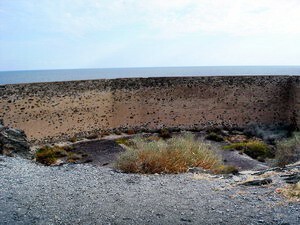 Ore was temporarily stored here before continuing to the sea. 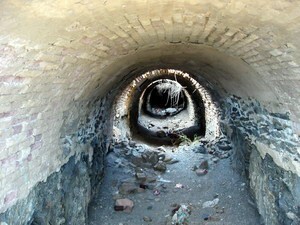 A view inside one of the exit tunnels from the intermediate hopper. 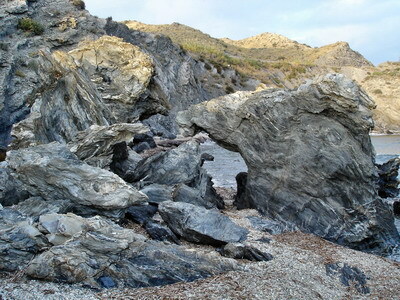 A view towards the sierra from the coast. In the upper centre of the picture is the intermediate hopper. From here an inclined plane ran down to the main hopper. This has been demolished by the new road. 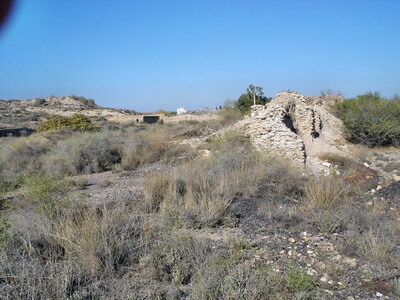 Bottom right are the remains of some calcination ovens. 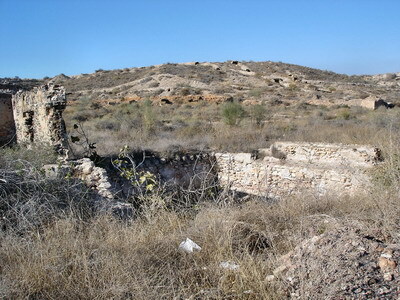 For an explanation of calcination, see the Lucainena to Agua Amarga page. The main hopper from which ore was taken via chutes to the cantilever pier and into waiting boats. The chutes were situated around the edge on the seaward side of the hopper. The exits of these chutes may be seen by walking round the outside of the hopper. 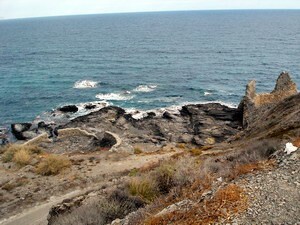 This site is easily accessed from the Juan de Los Terreros road. 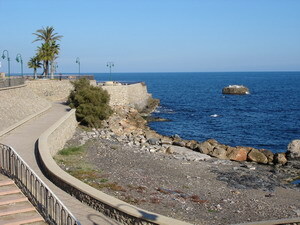 The view out to sea. 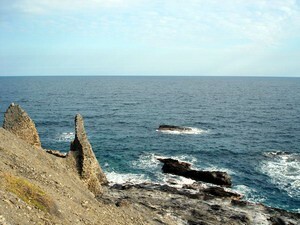 The cantilever peir was supported on the two rocks that can be seen out to sea a short way. 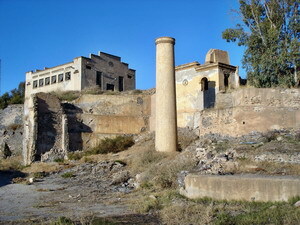 The remains of some administration buildings are also in view. A close up of the support piers for the cantilever pier. 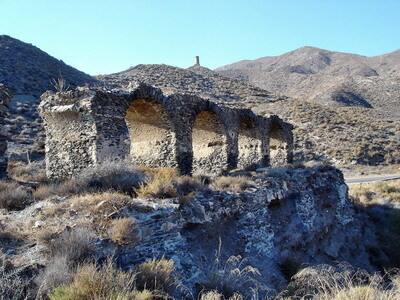 These mines were at one time run by Louis Siret,later archeologist - see the page on Los Millares. 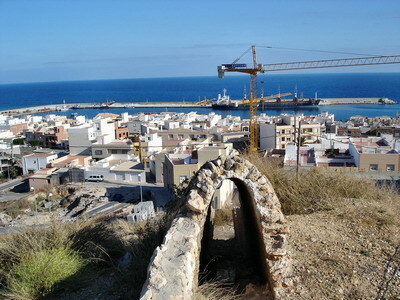 The ore was delivered to a cantilever pier at Villaricos. Only the pillar that supported the pier remains. 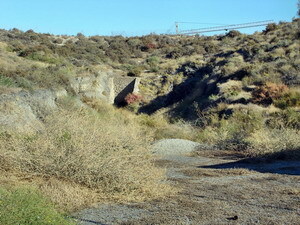 Much of the old workings remain but are private property. 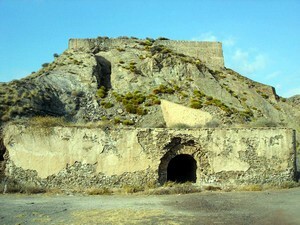 The entrance to the mines. The house on the right was, I understand, where Louis Siret lived. 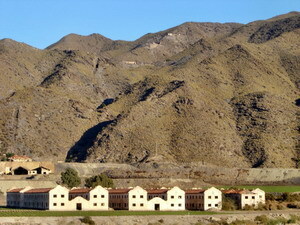 The workman's dormitories. These can be visited. Some of them still have the fixtures and fittings there. 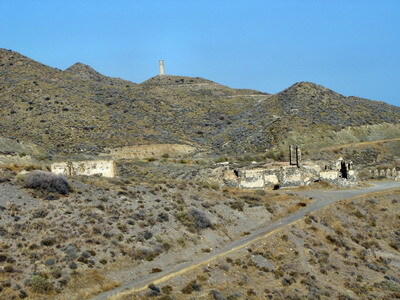 Behind can be seen some of the workings in the hills. 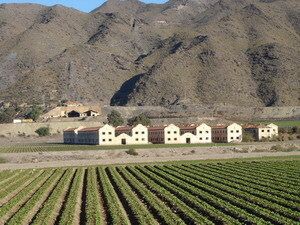 A closer view of the dormitories. 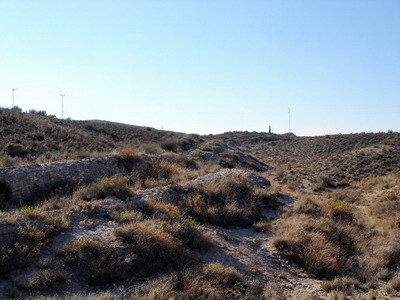 Part of the line of the railway looking towards Herrerias from Villaricos. 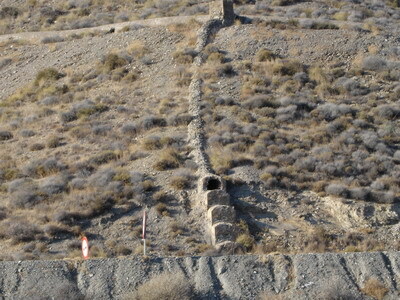 The short tunnel leading into Villaricos. 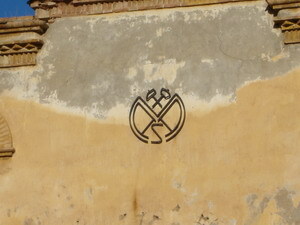 It is sited now at a Phoenician Archeological site. The pillar upon which rested the cantilever pier. Most of my research has been associated with iron ore because that was what the GSSR carried. 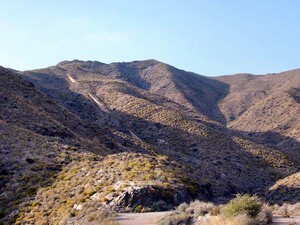 However, lead was big business many years before iron and the Sierra Almagrera is dotted with remains. 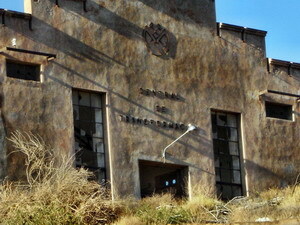 So although I don't know anything about the mines, I have taken pictures of them before they disappear for ever. 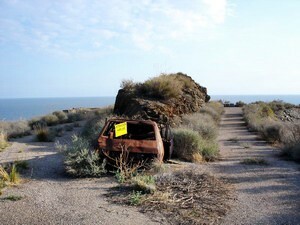 The first two pictures were taken in Garrucha, the remainder along the coast road towards San Juan de los Terreros. The final picture shows a typical flue to take the poisonous gasses from smelting away from the workers. 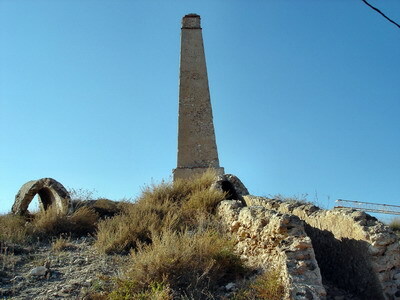 It was apparently the law that unlike iron ore, smelting lead had to be done in Spain. 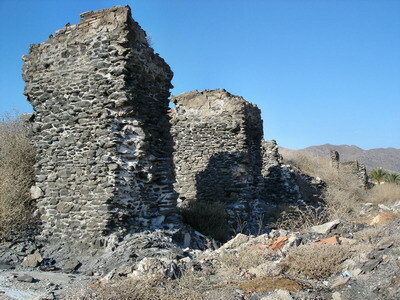 These sad remains are clinging to life (2008) but cannot last much longer. 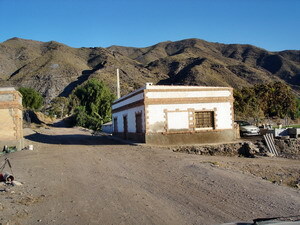 They are on the left about 3 km from Villaricos just before you cross the Almanzora river. 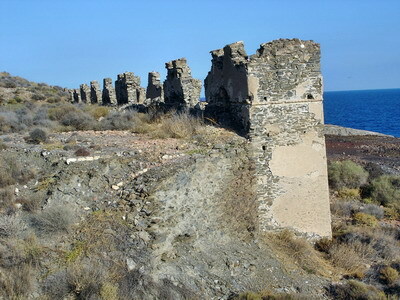 They are situated on the front line of the advancing army of villas in Vera Playa.